Thanks for looking at our Petmate Vari Kennel Portable Dog & Cat Kennel blue 10 pounds dogs or less! The unique assembly of a Petmate Compass kennel takes only seconds, representing an innovative solution for pet owners. Increased ventilation, doorway size and the addition of dual turn-dial door latches provide ultimate convenience for pet owners and extra comfort for pets. 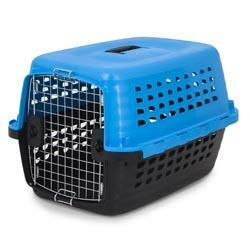 Two sizes of the Compass Kennel are available in fun fashion colors for small dogs and cats.